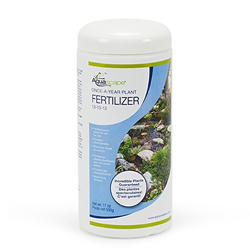 The Aquascape Once-A-Year Plant Fertilizer (13-13-13) contains a complete time-released fertilizer that will help maximize plant growth and increase flower production all in one single application. For Potted Plants: Remove the plant from the pond. Make a small hole in the soil (near the root mass or crown) with your finger or a blunt object with a minimum depth of 4". Add one scoop of fertilizer, push the soil around the hole and reposition the plant. For Plants in planting pockets: In the spring or during a clean out when the water level is low, make a small hole hole in the soil (near the root mass or crown) with your finger or a blunt object with a minimum depth of 4". Add one scoop of fertilizer, push the soil around the hole and recover with rocks. Depending on the size of the lily we recommend a minimum of 2 scoops for plants contained in pots from 1-3 gallons, 3-5 scoops for larger plants.